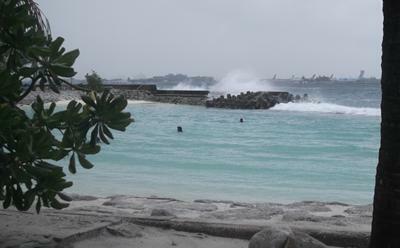 The causes of coastal flooding in the Maldives are more complex than previously thought, according to a new study from the University of Southampton. Authors of the paper, published in the journal Natural Hazards, examined wave and sea level data around historic flood events and found that multiple factors contribute to flooding in the Indian Ocean island chain, which has an average land elevation of just one metre. Wave ‘set up’ – the raising of water levels at the coast caused by breaking waves – was found to be the main cause of flooding. This effect was increased by prolonged swell wave conditions, where large, energetic waves are generated by wind storms thousands of miles away in the Southern Ocean. High astronomical tides, caused mainly by the gravitational pull of the Sun and the Moon, were also found to play a part. In addition, sea levels in the region are rising at a rate of about 4mm a year. At least 30 flood events have been recorded in the Maldives over the last 50 years, including major floods in the capital city, Malé. Flood defences, including sea walls and breakwaters, have reduced the flood risk in the islands, but adaptation is essential to all inhabited islands in the country, the authors warn. The study is part of ongoing research into coastal flooding and climate change adaptation at the University, led by Professor Robert Nicholls and Dr Sally Brown.